Considering their economic importance for Germany, the operators of digital infrastructure here are currently afforded no adequate political support or subsidization. Particularly in international comparison, the political framework conditions for the operators of digital infrastructures is suboptimal. This is the finding of a new study on the socio-economic opportunities and challenges of data centers and other operators of digital infrastructures in international competition, compiled by the Borderstep Institute on behalf of the Alliance for the Strengthening of Digital Infrastructures in Germany and eco – Association of the Internet Industry, and launched in Berlin today. “Well-functioning and high-performance digital infrastructures act as the basis for Germany’s successful digital transformation, and at the same time are growth and innovation drivers, as well as multipliers for other industry sectors, especially in the area of Industry 4.0,” says Béla Waldhauser, Spokesperson for the Alliance. Despite this, there has so far been little public and political awareness of this economic factor in Germany, and from a political perspective digital infrastructure remains almost completely unaddressed. 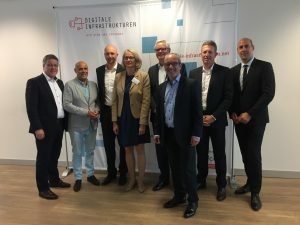 “This is surprising in view of the ambitious growth objectives regarding Germany’s digitalization, which the federal government recently defined in their new coalition agreement,” according to Waldhauser. The lack of specialist staff, lengthy approval processes, and last but not least, the high electricity costs are clear locational disadvantages and present a risk for Germany as a digital location. Germany has not done its homework, and this is not only in the area of broadband expansion: There is also need to catch up in the settlement policy and care of existing infrastructures. The German federal government must develop a comprehensive understanding of digital infrastructures in Germany. Data center providers, colocation and cloud infrastructure providers, and Internet and hosting service providers form the foundation of all digital value creation and innovation ecosystems. Their innovation and impact potential, as well as the challenges they are facing, must be given a stronger economic weighting and included in policy concepts. To exploit the full potential of digital infrastructures for the success of the digital transformation of society and the economy, there is no alternative to the rapid rollout of nation-wide broadband networks, and this must be driven forward more strongly by the federal government. The federal government must develop a consistent strategy for the strengthening of Germany as a data center location, which focuses just as much on aspects of international competitiveness and technological innovation for providers and users, as it does on aspects of data security and the digital supply of industry and society. a. The strategic establishment of high-performance and energy efficient hyperscalers, in order to also play a central role in the infrastructure of the digital world of tomorrow, for example, in the area of Artificial Intelligence. b. The conceptual integration of future scenarios in which decentralized requirements for micro data centers, as they are employed in edge and/or fog computing, will play a more and more decisive role in the areas of autonomous driving, Industry 4.0, and Smart Home & Smart City. c. The strengthening and targeted subsidization of existing infrastructures and expansion of the core infrastructure, so that Germany can maintain its position in the international locations competition. On the basis of an existing strategy, measures must be developed – collectively involving the federation, states, local governments, and industry – that are tailored to the diverse business models of data center operators and their customers, and also take all interests into account with regards to increasing energy and resource efficiency and exploiting innovation potential. The federal government must subsidize a strong research landscape focusing on data centers. Here, it is above all important to significantly expand existing strengths, e.g. not only in the areas of security and high performance fog and edge computing, but also through building concepts for the long-term increase in energy efficiency for existing and future infrastructures. To do justice to the increasing demand for and the rapid growth of the digital economy, application and approval processes, as well as conditions, must be adapted and made more efficient. This is especially the case for administrative processes for new constructions, changes, and modernizations. Here, it is important for the federation, states, and local governments to work in close alliance to find solutions for the providers of digital infrastructure services. Running in parallel to the digitalization of the economy comes an attendant increase in need for technical knowledge for the construction, expansion, and operation of digital infrastructures in Germany. Here, the availability of specialists are the decisive locational factor in European and international competition. A nationwide campaign for increasing the attractiveness of the field of work of digital infrastructures must be supported and subsidized, so that also in future it will be possible to obtain and retain sufficiently qualified staff for occupations in this sector. In dealings with the providers of digital infrastructure, politics must learn and implement a cross-ministry, coordinated approach, so that the forthcoming challenges – for example in the areas of the strengthening of economic factors and the securing and generation of specialists, as well as energy prices and research approaches to increasing energy efficiency – trigger a viable overall picture for Germany as a high-performance and competitive location. Power prices are a significant competitive factor for data centers. The power prices in Germany are as much as twice as high as other European countries. This derives above all from the considerable levies, duties, and the energy tax, which, in this form and to this extent, does not exist in other countries. The levies, duties, and taxes for data centers must be reduced to a moderate level, to minimize the competitive disadvantage and to remain competitive within Europe. This would make the energy for heat pumps more affordable, which would drive forward the energy transition, especially in sectors like the supply of heating and electro mobility, and at the same time make data centers, the sector of the future, internationally more competitive. A summary of the Borderstep study “Importance of Digital Infrastructures in Germany” is available online. The Internet industry is a key sector and growth engine of our time: Its proportion of the entire economy has been growing continuously for years. And yet, while operators and large providers of social media platforms are often in the focus of politics and in the public eye, companies located at the beginning of the Internet value chain – namely operators of digital infrastructures such as data centers or colocation providers – remain largely unknown. Nevertheless, this sector is of outstanding importance for successful digital transformation in Germany. The Alliance for the Strengthening of Digital Infrastructures in Germany brings together leading companies from different branches of digital infrastructures, such as data center operators, colocation providers, Internet service providers, carriers, cloud providers, software vendors, and representatives from the user industry, under the auspices eco – Association of the Internet Industry. Its members want to raise awareness for the importance of their sector for Germany as a digital location, and engage in constructive dialog with politics and the public.